The first Global Neurosurgery Symposium took place on January 18th and 19th at the Weill Cornell Medical College in New York. It was hosted by Roger Härtl, M.D. and Caitlin Hoffman, M.D., under the auspices of Philip E. Stieg, Ph.D., M.D., Chairman and Neurosurgeon-in-Chief of the department. 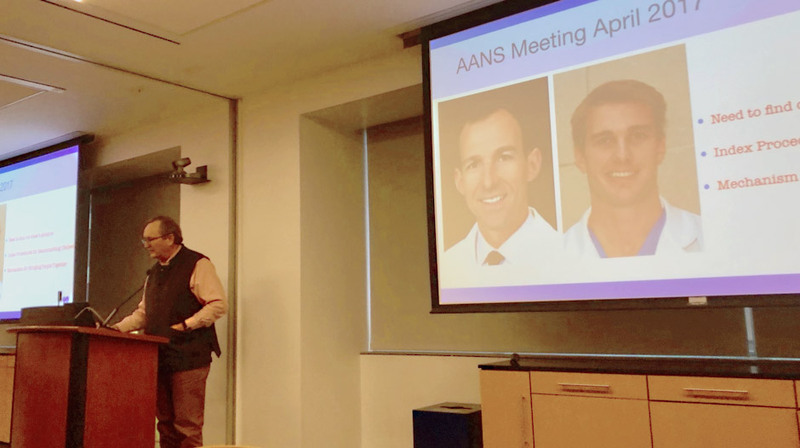 The aims of the symposium were very ambitious; This course is being planned to connect neurosurgeons, other physicians, and health policy leaders in Global Health Initiatives in Neurosurgery. We plan to identify determined population-based needs in different regions and assess mechanisms of current success and continued barriers, then use these experiences and different perspectives/insights to form a strategy for improving global health in neurosurgery and developing metrics to assess success. The course was fully subscribed which gives an indication of the current interest in the field and many of the speakers were those with the greatest experience of neurosurgical practice and education. The meeting was kicked off by Dr Walt Johnson, a neurosurgeon by training, who leads the Emergency and Essential Surgical Care programme at the WHO and he gave us a vision of the place that neurosurgery holds in the field of global health. It was an excellent starting point for those who are unaware of the importance of our speciality especially in LMICs where neurosurgical conditions, especially neurotrauma, play a significant part. Dr Johnson was followed by a session describing the efforts of neurosurgeons in a number of locations around the world including Tanzania, Vietnam, Uganda, Nepal, The Maldives, Ukraine and Cambodia. The lead on this session came from Dr Barth Green who described his efforts in Haiti following the natural disasters that have affected the Island and it was the presentations given by Dr Green and Dr Rhageb that set the tone of the whole meeting and from them came many pearls of wisdom about the need to be, at all times, sensitive to the local situation. Indeed, one of the major strengths of this meeting was to learn from others the mistakes that they had made along the way and how they had overcome them. The presentations covered the experience of individual surgeons, small surgical teams and then the large teams put together by such organisations as Duke University who under the lead of Dr Michael Haglund have developed an enormous programme covering all aspects of neurosurgical care and infrastructure. Another vital contribution came from Dr Robert Dempsey who described the pioneering role that FIENS has played for 50 years in neurosurgical education worldwide and he stressed the importance of long term collaborative partnerships in improving global Neurosurgical care. Seven of the presenters at the meeting were already InterSurgeon members and the role of InterSurgeon was discussed by several on the first day of the meeting, notably Dr David Adelson who has previously strongly supported us at the AANS/CNS joint section meeting in Nashville. Drs Härtl and Hoffman very kindly allowed me to give a presentation on the second morning to allow the attendees to get a perspective of our work and of how InterSurgeon can facilitate collaborative partnerships. The timing for this was perfect as we had just launched adult neurosurgery and we gained a number of new recruits during and after the meeting; in addition, there were a number of excellent suggestions as to how we could add to the resources of the InterSurgeon website, particularly to allow collaborative research. Prof Peter Hutchinson presented the plans for the Global Health Research Group on Neurotrauma, who have become an InterSurgeon partner and with whom we hope our members will work as the project goes forwards. Dr Gail Rosseau, our champion for adult neurosurgery, spoke on developing the skills of neurosurgeons trained in HICs to work with colleagues in LMIC setting particularly those at the start or end of their neurosurgical careers and drew attention to the course that she is holding at the AANS meeting in San Diego in April and at the WHA meeting in Geneva in May. A vital contribution to the meeting was played by Dr Kee Park from the Harvard Program in Global Surgery and Social Change. Dr Park has played a very significant role in the development of Global Neurosurgery and was present at the first discussions between myself and Dr Jim Johnston at the AANS meeting in Los Angeles in 2017, where the idea for InterSurgeon was born. Dr Park not only touched on his experience in the field in Cambodia but also the importance of National Surgical plans and the current series of workshops being run by the Harvard Program. In addition, Dr Park also held an excellent workshop immediately following the meeting on the policy recommendations for strengthening traumatic brain injury management in LMICs and this will prove to be an excellent resource when finalised. In summary, the symposium was well conceived and a very welcome start to widening knowledge about Global Neurosurgery. We heard many wise words and words of encouragement to those considering entering the field. InterSurgeon members featured prominently at the meeting and InterSurgeon was mentioned on several occasions and resulted in our being invited to give a presentation, which was well received. The meeting closed with optimism and the expectation of further symposia to come but with the acknowledgement that much greater representation from LMICs is required to take this to the next level.